Some people do their best thinking in the shower, or on long jogs. Me, I come up with the best ideas when I'm brushing my teeth. On Saturday night, I was getting ready for bed and brushing away with my current favorite toothpaste (I'm a toothpaste addict! Right now I'm into Tom's new flavor Wicked Mint), when I thought "savory marshmallows!" EEEP! How come people don't make savory marshmallows? Would they taste good? Would they roast well? 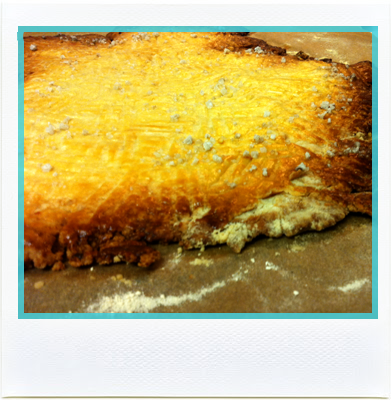 How delicious would a savory flavored marshmallow be on top of a pumpkin soup or on a sweet potato casserole?! I found a fellow blogger that had already given savory marshmallows a go! I was so excited to make them I could barely sleep! Lauren has breakups on her mind. Butter Breakup cookies, that is. The next morning my friend Lauren emailed me asking me to hang out and keep her busy for a little while. The poor dear had a tough week, and when that happens we all need good friends. 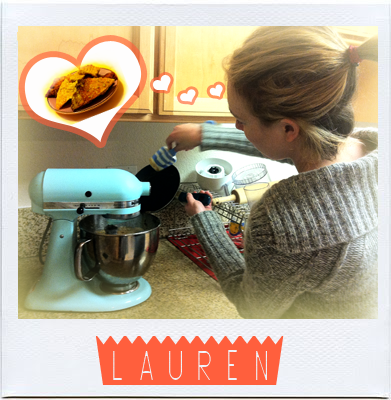 Plus, Lauren happens to love mixing sweet and savory like myself. 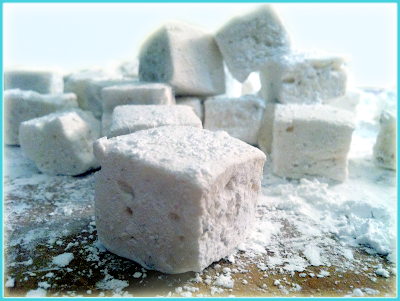 I decided to make browned butter and sage marshmallows, and they turned out better that I could imagine. Lauren made breakup cookies, which are a free form take on shortbread cookies with delicious with butter caramelized edges and chunks of Fleur de sel on top. The cookies are baked in one big sheet and then they are broken up into pieces. 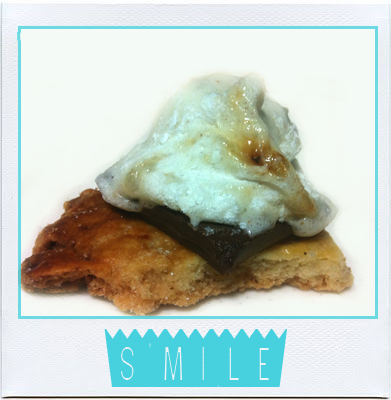 When the world tries to shatter you, sometimes you need to shatter a cookie. this was easily the best s'more I've ever had. Now I bet you want to make your own marshmallows, so let's get down to it! One note, brown butter and sage marshmallows are wonderful, but if you want to give marshmallow gifts, I'd suggest making a vanilla version (or any non-butter version) because they will last longer. As in, they last forever. Spray your baking pan with cooking spray and wipe with a paper towel to make sure you get all the edges. Measure the gelatin powder into your stand mixer bowl. Add the water to the gelatin while whisking gently with a fork. Continuing stirring until the gelatin reaches the consistency of apple sauce and there are no more large lumps. Set the bowl back in your standing mixer. Combine the water, corn syrup, salt, sugar and the sage in a 4-quart sauce pan. See #1 below. Place this over medium-high heat and bring it to a boil. As it’s coming to a bowl, occasionally dip your pastry brush in water and brush down the sides of the pot. This prevents sugar crystals from falling into the liquid, which can cause the syrup to crystallize. Do not stir the sugar once it has come to a boil!!! Swirl the pot gently if you must, but you should just leave it alone. Clip a candy thermometer to the side of the sauce pan and continue boiling until the sugar mixture reaches 250°F. Take the pan off the heat and remove the thermometer. While your sugar mixture is coming to 250, melt your butter until it is brown and foamy in a skillet. See #3 below. With the mixer on medium speed, very carefully pour the hot sugar syrup down the side of the bowl into the gelatin. 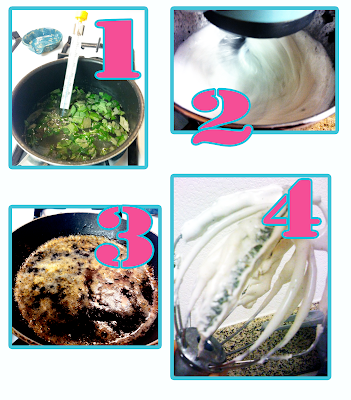 The mixture will foam up. See #2 below. When all the syrup has been added, cover the bowl with a cloth and increase the speed to high (the cloth protects from splatters). Whip for 10-12 minutes, until it looks like glossy meringue. When the mixture is cool, you are finished mixing. You'll notice that the big sage bits stick to the whisk, so you don't have to worry about straining them out. See #4 below. Using your stiff spatula, scrape the marshmallow mixture into the pan. Wet your fingers and smooth the top so it’s even. Let the mixture sit out uncovered for 12-15 hours to set and cure. Combine the powdered sugar and cornstarch in a bowl. Sprinkle the mix over the top of your pan of marshmallows, then turn them out onto a cutting surface. Then cover the whole thing with the coating mixture. 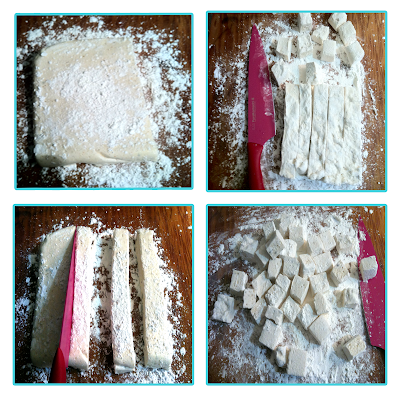 Using a sharp knife or pizza wheel, cut the marshmallows into strips and then into squares. It helps to dip your knife in hot water so it slides right through cleanly. I then put the marshmallows into a bowl and poured over the rest of the coating mixture and tossed to coat. Marshmallows will keep in an airtight container at room temperature for several weeks. Since this recipe has butter, it decreases the shelf life of a normal marshmallow. Leftover brown butter and sage marshmallows can be stored in a sealed container for weeks. Marshmallows made without butter can be stored in a sealed container for eternity. Which is about how long those stale jet puff marshmallows you buy have been around. Homemade marshmallows are easy to make, can easily be adapted to suit your tastes (chocolate peppermint? lemon vanilla? ), and would make great gifts!